Honda 6 Speed Manual Dilemma "Can't Replicate the Problem"
This article will provide a basic overview of just about all of the different types of front suspensions that have been used on production and racing vehicles since the inception of the automobile. While some of the older styles are obsolete it is still important to learn about them because it provides valuable insight into why the cutting edge suspensions of today perform so much better. This article gives a thorough look Street Sports in Lexington, KY. This is the shop we use and we explain why we highly reccommend it. If you aren't fortunate enough to be able to stop by Street Sports we also included a guide for how to choose your own shop. (courtesy Shawn Sexton of Street Sports) Check it out and see why we think Street Sports is the place to go. In lay man�s terms, degreeing your cams means synchronizing the camshaft's position with the crankshaft. A few degrees of misalignment can dramatically affect the engine's operation. A car with properly degreed cams will make more power than a car with undegreed cams. And as an additional bonus, with the cams dialed in properly, things such as idle, response, and drivability tend to improve as well. For those of you out there with R/T Neons, this article is intended to provide you with a simple and effective mod list of suspension components to make your R/T out handle a 911. The wise consumer makes a better purchase than the ignorant one, so if you are seriously interested in turbo performance you at least need to know the fundamentals. This article is dedicated to the turbocharger, ultimately the most powerful of all forced induction systems. There have been several different supercharger designs used in automotive history, but only a few remain in common use today. This discussion will explain how each works and give some basic information on the advantages/disadvantages of each. The intention with this article is to shed some light on the theories behind turbocharging the modern engine, and the wonderful advantages it gives us in both speed and basic engine design issues. This post is also to try and give people a better understanding of supercharger systems and how they work to make such a simple thing as an engine even simpler. How do sway bars work, and how can you use them to tune your car�s suspension? Most performance people know that stiffer rear sway bars reduce the understeering tendencies of a vehicle, but if you ask them exactly why this is they generally draw a blank. Usually they know the results, but not the reasons behind chassis tuning. This article is intended to answer those questions as well as give readers a better understanding of what goes on in your suspension when you take a corner. After giving the turbo on our WRX a little room to breathe with the addition of a full 3" Invidia turbo back exhaust and up pipe. We decided to open up the turbo from the other end by installing a new 2.5" cold air intake. 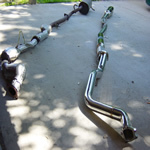 The first mod installed on the Project WRX was a complete 3" stainless steel Invidia turbo back exhaust and Invidia stainless up pipe. The install of this package is a simple "bolt-on" affair that can add as much as 30+ horsepower.